From the standpoint of accountability this is simply unacceptable. A section of mountain howitzers assigned to a cavalry regiment and three independent batteries. We should see eight batteries listed. Furthermore, there was a battery from the heavy artillery which had a section detailed to the Army of the Potomac during this period. 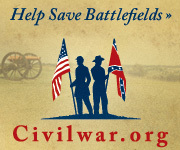 And, with the Confederate invasion of Pennsylvania in June, we could also add in a good number of militia batteries called out to defend the Commonwealth. Though, those batteries were not officially in the Federal army, just called out in defense of their state. Still if we are counting all the gun tubes, those deserve mention. 11th Pennsylvania Cavalry – The line read “Col. 11th Cav. Stores in charge.” And among those stores were two 12-pdr mountain howitzers. The 11th was assigned to the Seventh Corps, Department of Virginia and spent an active spring with detachments posted around the Suffolk and Norfolk area. Colonel Samuel P. Spear commanded. The regimental history has passing mention of “our” howitzers, but no specifics. However, on a reconnaissance mounted towards the end of the month one howitzer, managed by Sergeant Stewart B. Shannon, of Company I, went along. Battery A: Schaffer’s Battery. Not listed. Commanded by Captain Stanislaus Mlotkowski. The battery was posted to Fort Delaware, in the Middle Department, and serving as garrison artillery despite the light artillery title. Battery B: Muehler’s Battery, but appearing as Stevens’ Battery (Line 36) on this summary, for Captain Alanson J. Stevens. “In the field” with four 6-pdr field guns and two 3.80-inch James Rifles. The battery was assigned to Third Division, Twenty-first Corps, Army of the Cumberland. Thus “in the field” was part of the Tullahoma Campaign. Battery C: Thompson’s Battery. Not listed. Captain James Thompson’s Battery was, at this time, consolidated with Battery F (below) and assigned to 1st Volunteer Brigade, Artillery Reserve, Army of the Potomac. Their six 3-inch Ordnance Rifles went into action at the Peach Orchard, at Gettysburg, around 5 p.m. of July 2, two guns facing west and four south. Battery D: Durell’s Battery. Not listed. Captain George W. Durell’s battery was part of the well traveled First Division (having moved from the Second Division), Ninth Corps, taking in the summer at Vicksburg, Mississippi. Battery E: Knap’s Battery. Appearing on Line 35 of this summary, as at Catlett’s Station, Virginia, with six 10-pdr Parrotts, as of August 5. The battery was assigned to Twelfth Corps, Army of the Potomac. When Captain Joseph M. Knap resigned on May 16, Lieutenant Charles A. Atwell assumed command. Atwell’s battery held an often underappreciated position on Power’s Hill at Gettysburg. Battery F: Hampton’s Battery combined with Battery C (above) at this stage of the war. Their monument is next to Battery C’s at Gettysburg. Lieutenant Nathaniel Irish was the ranking officer on the rolls of the battery at this time. Battery G: Young’s Battery. Not listed. Captain John Jay Young’s battery was also assigned to Fort Delaware. Battery H: John Nevin’s Battery. Commanded by Captain William Borrowe and appearing as Line 34, at Alexandria, Virginia, with six 12-pdr Napoleons. The battery was assigned to the Defenses of Washington, serving south of the Potomac. Battery I: Getting ahead of ourselves… Captain Robert J. Nevin’s Battery would not form until December 1863. So we can match the three lines in the summary to three of the independent batteries. Though we are conspicuously missing two batteries in field service – Battery C and Battery D.
The Keystone Battery: Captain Matthew Hastings commanded. Listed in Bate’s as a militia battery, the Keystone Battery was assigned to the Defenses of Washington in August 1862. In June 1863 the battery was at Camp Barry. Before mustering out in August 1863, the battery briefly served in the field with Third Corps. Their muster out date (August 20) might explain the lack of report in this summary. Battery H, 3rd Pennsylvania Heavy Artillery: The regiment’s batteries garrisoned several points from Baltimore to Fort Monroe (and perhaps we need a detailed posting on their service). But Battery H, Commanded by William D. Rank, from Baltimore, had a section of 3-inch Ordnance Rifles sent forward to guard the railroad lines in Maryland. That section was then caught up in the Gettysburg Campaign and saw serviced with First Brigade, Second Division, Cavalry Corps. For more on this story, see Dana Shoaf’s video report. 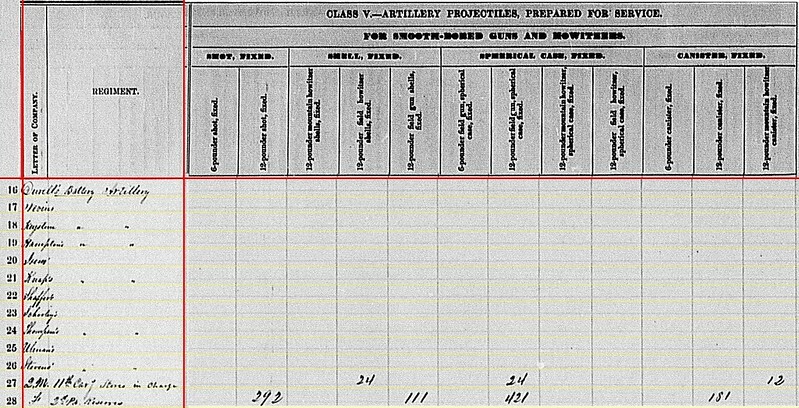 11th Pennsylvania Cavalry: 100 case and 36 canister for 12-pdr mountain howitzer. Battery H ( Borrowe’s): 288 shot, 96 shell, 292 case, and 103 canister for 12-pdr Napoleons. Battery B (Stevens’): 448 shot and 200 case for 6-pdr field guns. Battery E (Knap’s): 480 shell, 600 case, and 144 canister for 10-pdr Parrott. Battery B (Stevens’): 100 shell for 3.80-inch rifles. Battery H ( Borrowe’s): Fourteen Navy revolvers and sixty-one horse artillery sabers. Battery E (Knap’s): Thirty-seven Navy revolvers and eight horse artillery sabers. Battery B (Stevens’): Seven Navy revolvers, five cavalry sabers, and fourteen (?) horse artillery sabers. In closing, we might complain the clerks “shorted” us four important batteries (if we include the Keystone Battery and Rank’s heavy artillerists). But what was not listed provides us ample room for discussion. And if you are keeping track, I “owe” a posting on the Pennsylvania militia batteries along with a full explanation of the 3rd Pennsylvania Heavy Artillery’s dispositions. These were “storied” batteries, some of which played important parts in great battles. While tracking these batteries by the name of a commander or organizer will fit into those stories, there are some administrative inefficiencies to that manner of identification. And as these summaries are more administrative in nature, there is some matching and sorting needed to ensure a complete and accurate assessment of the data. Durrell’s Battery: No return. This was Captain George W. Durell’s battery, also known as Pennsylvania Independent Battery D. This battery reported six 10-pdr Parrotts earlier in the fall. Nevin’s Battery: No return. Here’s where the battery designation could have helped. There were two Nevin’s Batteries. Captain John I. Nevin’s battery, known as Pennsylvania Independent Battery H, was organized in late September 1862. 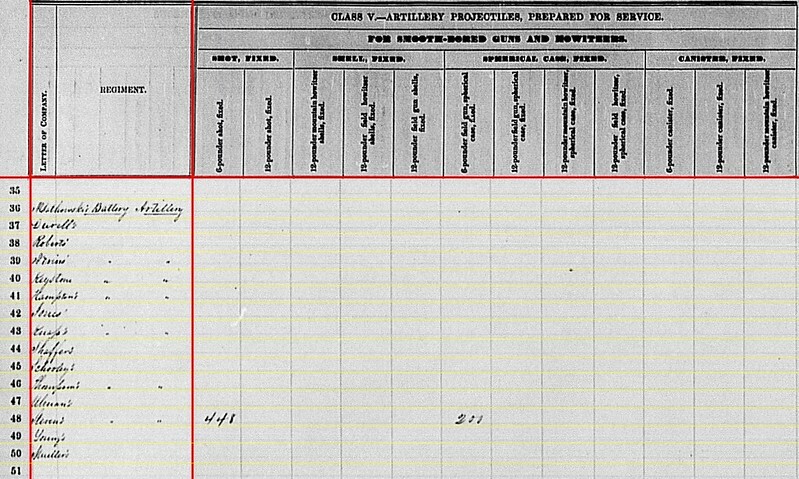 Captain Robert J. Nevin’s Pennsylvania Independent Battery I was not organized until June 1863 (with a six month enlistment). So let us assume this to be John Nevin’s. In that case, Nevin’s battery was at Camp Barry at the time. Keystone Battery: At Union Mills, Virginia with six 10-pdr Parrotts. This was Captain Matthew Hastings’ battery, assigned to Casey’s Division and part of the Washington defenses. Hampton’s Battery: At Aquia Creek, Virginia with six 10-pdr Parrotts. This would be Captain Robert B. Hampton’s Pennsylvania Independent Battery F, assigned to Second Division, Twelfth Corps. 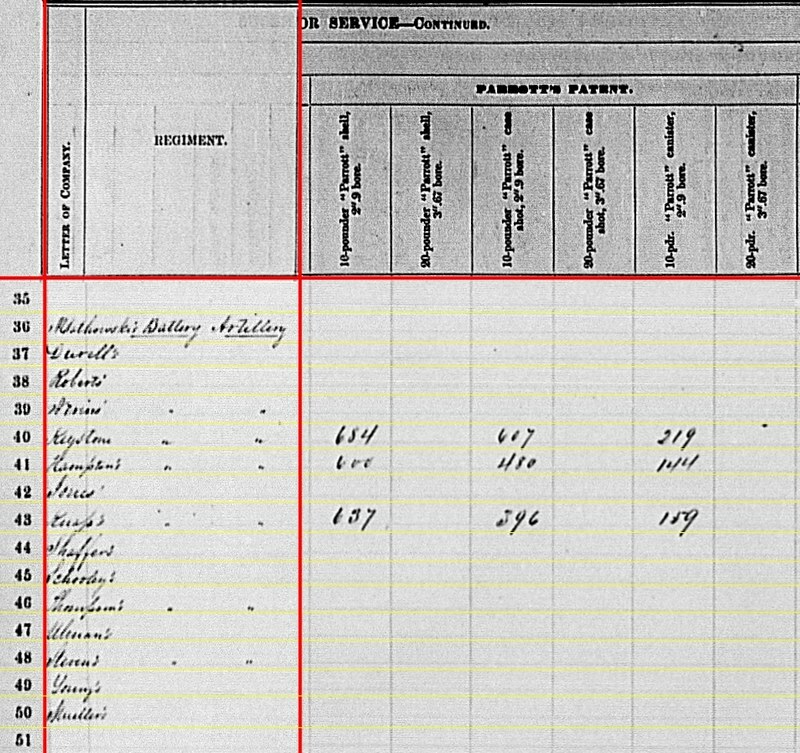 Illegible name in row 20: I cannot make out what the battery name is on this row. At first I though “Isaac” but that does not match to any in my records. At any rate, the line is blank with no return. Knap’s Battery: At Fairfax Court House with six 10-pdr Parrotts. Captain Joseph M. Knap’s efficient battery was also known as Pennsylvania Independent Battery E. The battery was also assigned to Second Division, Twelfth Corps. Shaffer’s Battery: No return. This, I think, is Captain Frank Schaffer’s Pennsylvania Independent Battery A, assuming there is a missing “c” in the name. If correct, then this battery’s location was Fort Delaware, where it spent the entire war. Schooley’s Battery: No return. The only match I have for this name is Schooley’s Independent Company Heavy Artillery, Captain David Schooley in command. If that is the case, then the battery’s location was at Fort Lincoln, Washington, D.C. for the reporting period. Thompson’s Battery: At Fletcher’s Chapel, Virginia with four 3-inch Ordnance Rifles. This would be Captain James Thompson’s Pennsylvania Independent Battery C. Assigned to Second Division, First Corps at this time. Ulman’s Battery: No return. The name matches to Captain Joseph E. Ulman’s independent battery organized in February 1862. This battery was not accepted as artillery and disbanded when told to reorganize as infantry, in March of that year. 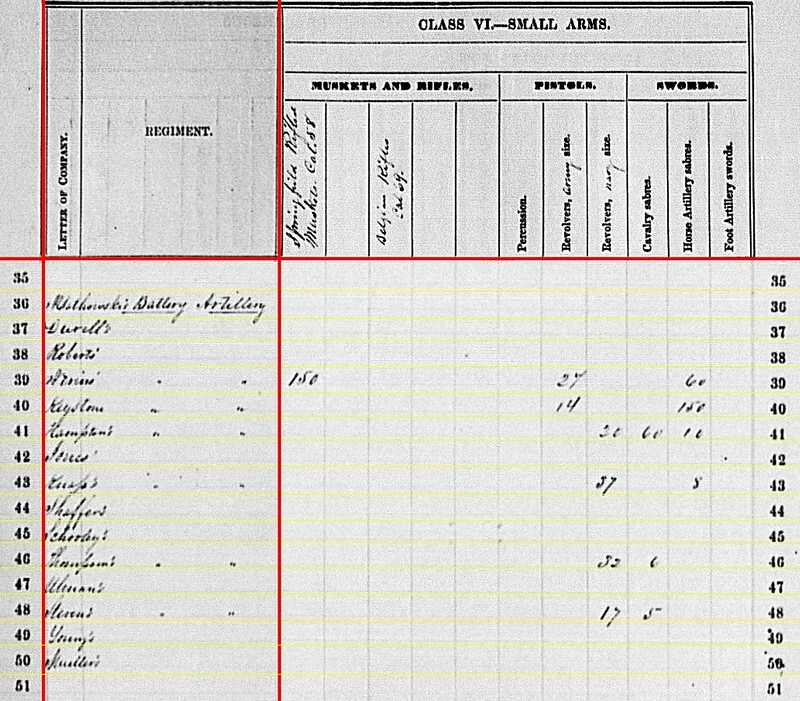 Why it was still on the rolls is a 150-year-old question for the clerks. Stevens’ Battery: At Murfreesboro, Tennessee with four 6-pdr field guns and two 3.80-inch James Rifles. There was but one Pennsylvania battery at Stones River, and that was Lieutenant Alanson J. Stevens’ Pennsylvania Independent Battery B. I’ve seen it mentioned in correspondence as the 26th Pennsylvania Battery, and Muehler’s Battery (after Captain Charles F. Muehler who organized the unit). The battery supported Third Division, Left Wing, Fourteenth Corps. Stevens reported expending 1,650 rounds during the battle, losing seven horses, two men killed, and seven men wounded. 11th Cavalry stores in charge: At Camp Suffolk, Virginia. Reporting three 12-pdr field howitzers. 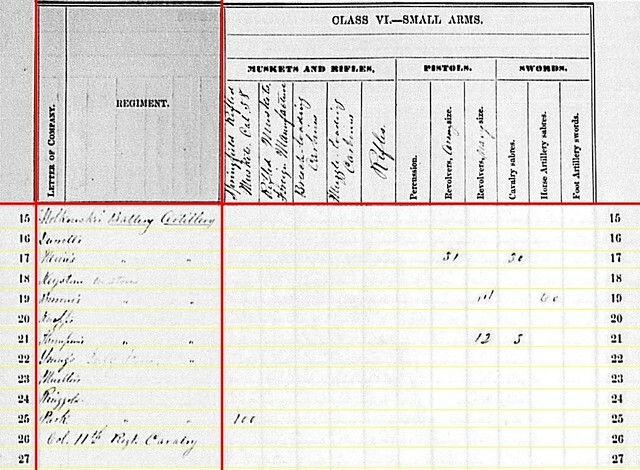 Company F, 2nd Pennsylvania Reserves: Reporting from Belle Plain, Virginia with no cannon but stores on hand. I am not familiar with any association of this formation to an artillery battery. And this will be a significant amount of ammunition on hand. Looking a few months into the future, as it would be from December 1862, we know that Batteries C and F would later consolidate. So there is one battery we might plug into that row 20 question mark. Captain John Jay Young’s battery, organized in August 1862, spent the war at Fort Delaware (good duty if you can get it), to the chagrin of the War Department. Another pair of batteries that deserve mention with respect to Pennsylvania batteries at this time in the war was Segebarth’s Battalion Marine Artillery, Batteries A and B. Those were also posted to Fort Delaware in December 1862. That unit would become part of the 3rd Pennsylvania Heavy Artillery later in the war. 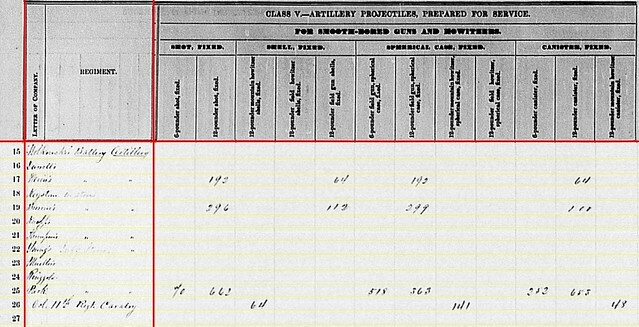 11th Cavalry: 24 shell, 24 case, and 12 canister for 12-pdr field howitzer. 2nd Reserves: 292 shot, 111 shell, 421 case, and 181 canister for 12-pdr Napoleon. Stevens’ Battery might be excused, having fired all those rounds at Stones River, from offering a quantity for their 6-pdr guns. Thompson’s Battery: 82 canister, 16 percussion shell, 144 fuse shell, and 259 bullet shell for 3-inch rifles. 2nd Reserves: 400 fuse shell and 132 bullet shell for 3-inch rifle. Thompson’s Battery: 216 3-inch Dyer’s shrapnel, 3-inch bore. Keystone Battery: 684 shell, 339 case, and 319 canister in 10-pdr. Hampton’s Battery: 120 shell, 480 case, and 144 canister of 10-pdr. Knap’s Battery: 507 shell, 213 case, and 136 canister for 10-pdr. Hampton’s Battery: 480 Schenkl shot for 10-pdr Parrott. That is Thompson’s Battery with 33 Schenkl shell for 3-inch rifle. Keystone Battery: Fourteen Army revolvers and 150 horse artillery sabers. Hampton’s Battery: Twenty Navy revolvers, sixty cavalry sabers, and ten horse artillery sabers. Knap’s Battery: Thirty-seven Navy revolvers and eight horse artillery sabers. Thompson’s Battery: Thirty-two Navy revolvers and six cavalry sabers. Stevens’ Battery: Eight Navy revolvers and eight cavalry sabers. 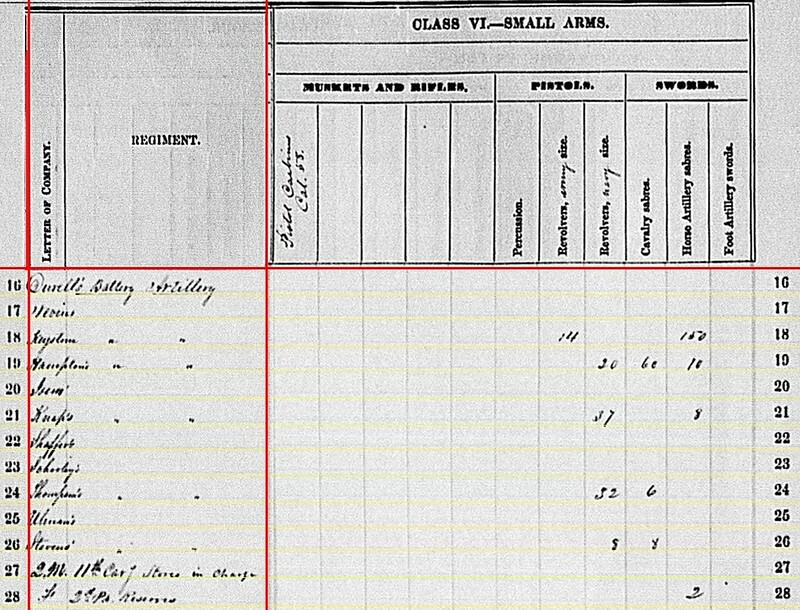 2nd Pennsylvania Reserves: 2 horse artillery sabers. Yes, a lengthy post for just a handful of batteries. Consider, if you will, the problem confronting the clerk entering this information. They have “friendly” names assigned that mention battery commanders. But there was an official designation that the commanders in the field were using (at least in some correspondence and order of battle). The clerk could not consult the “Alternate Designations” section in the back of the Official Records or search through Frederick H. Dyer’s Compendium. Maybe we don’t have room to complain?